Introduction: Cement-retained restorations are the most common mode of attaining retention in implant prosthesis. Surface modifications can enhance the retention of the cement-retained implant restorations. Materials and Methods: A total of 45 copings (n = 45) were fabricated and divided into three groups based on the types of cements used: Group A – zinc phosphate cement, Group B – zinc polycarboxylate cement, and Group C – glass-ionomer cement. Each group was subdivided into three subgroups depending on the surface treatment employed: Subgroup 1 – unmodified copings (controlled group), Subgroup 2 – sandblasted copings, and Subgroup 3 – roughened abutment. The blocks with abutments on which the coping was cemented on them were locked on a universal testing machine. Results: The mean load required to debond the copings cemented with zinc phosphate cement under various surface modifications was found to be 154 N for unmodified copings, 184 N for sandblasted copings, and 171 N for roughened abutments. 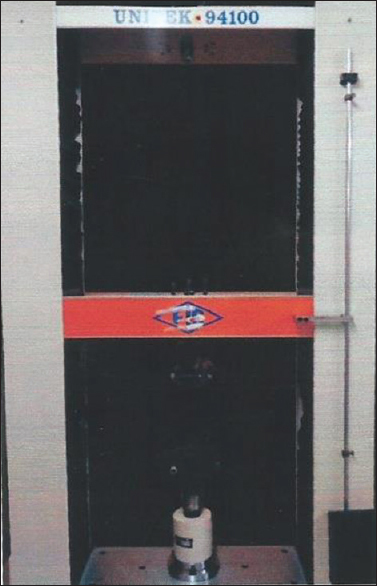 The mean load required to debond the copings cemented with zinc polycarboxylate cement under various surface modifications was found to be 212 N for unmodified copings, 325 N for sandblasted copings, and 390 N for roughened abutments, respectively. The mean load required to debond the copings cemented with Type 1 glass-ionomer cement under various surface modifications was found to be 302 N for unmodified copings, 413 N for sandblasted copings, and 412 N for roughened abutments. Conclusion: The retentive properties of the three types of cements tested in this study were statistically significant. Type 1 glass-ionomer cement shows the highest mean retentive strength, followed by zinc polycarboxylate and zinc phosphate cement. There was no statistically significant difference between the sandblasted and roughened abutment copings cemented with Type 1 glass-ionomer cement. Cemented implant restorations have become a popular alternative and exhibit the potential advantages over screw-retained restorations, which include the elimination of screw loosening, better esthetics, easier control of occlusion, simplicity, lower cost, and passive fit. Ideally, the cement on implant-retained restorations should provide enough retention to prevent it from loosening during normal service and allow the restoration to be removed without damage to the abutment, the restoration itself, and the peri-implant tissues. There are no studies suggesting that any one cement is better than the other at retaining cement-retained crowns to implant abutments. Forty-Five commercially Pure Titanium, Single-Piece implant analogs (Noris Medical Systems Pvt. Ltd.) of 6-mm height and 4.5-mm diameter were used in this in vitro study. Forty-five PVC pipes of height 3 cm and 1.5-cm diameter were used to mount the implant analogs. In the screw access channel of the implant analog, a dummy bur was secured to the vertical rod of the Dental surveyor (Ney Dental Surveyor) [Figure 1] to maintain it in a straight vertical position. The movable cast holder was adjusted parallel to the base platform of the surveyor and to the floor. 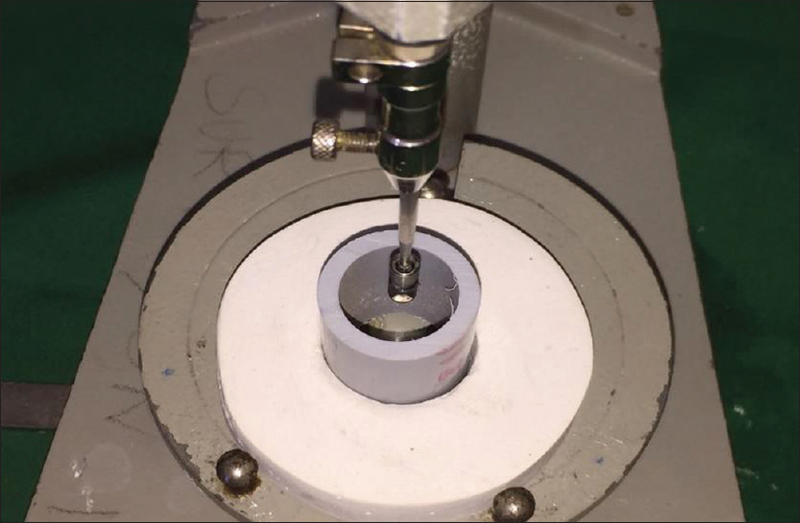 The PVC rings were placed on the cast holder, in which plaster of Paris Template has been fabricated and held on the cast holder of the Dental Surveyor to maintain the center position of the PVC ring, thereby the implant analog. The analogs were held vertically in the center of the PVC rings. Self-cure acrylic resin (DPI RR Cold Cure Batch no-4152) was mixed in the ratio of 3:1 and poured into the PVC rings in its wet sandy stage. The vertical rod was then inserted into the acrylic up to the finish margins of the analogs. The entire assembly was maintained until the acrylic resin sets completely [Figure 2]. Straight abutments of the corresponding diameter, each of a 3 mm-collar height and abutment height of 8 mm (Noris Implant Systems Pvt. Ltd.), were placed into the implant analogs, and the screw was torqued up to 20 Ncm torque. The access holes of these screws were blocked using DPI RR Self-cure Acrylic resin (DPI RR Cold Cure Batch no-4152). The copings were divided into three groups, that is, Group A, Group B, and Group C (n = 45) with 15 copings in each group, respectively. Fifteen copings in each group were subdivided into Group A1, A2, and A3; Group B1, B2, and B3; and Group C1, C2, and C3. The blocks with abutments on which the coping was cemented on them were locked on a universal testing machine – UNITEK Testing Machine [Figure 3]. 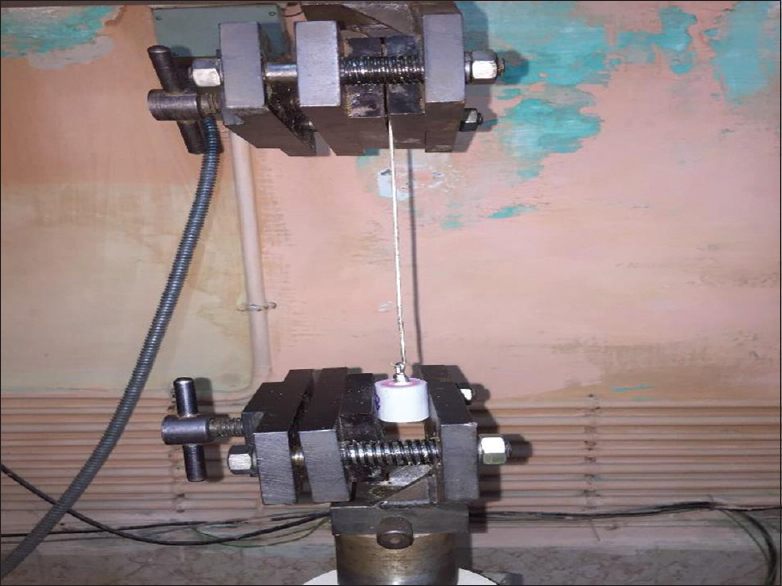 The Hook of the testing device was engaged in to the loop fabricated on the occlusal surface of the coping and a load was applied to pull the coping away from the abutment [Figure 4] at a speed of 5 mm/min (Pull Test Applied). The force at which the bond failure between coping and abutment occurred was recorded as the peak load. All the samples were subjected to the same testing protocols for all the three luting agents. 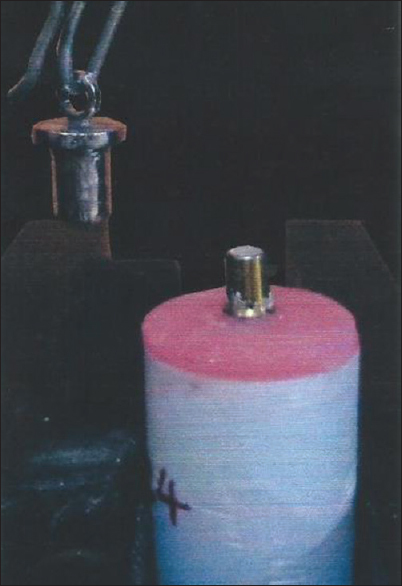 Two-way ANOVA test has been used to compare the load failure to debond the copings cemented with glass ionomer, zinc polycarboxylate, and zinc phosphate cement. Scheffe's multiple comparison test has been used to compare the load required to debond the copings when three types of cements were used with two surface modifications. All the 45 samples were subjected to the same testing protocols. The mean and Standard deviation of Failure load of Zinc Phosphate, Zinc Polycarboxylate and Glass Ionomer Cements are shown in [Table 1]. Two-way ANOVA test has been applied to compare the load required to debond the copings that were statistically significant between the types of cement used and the surface modifications applied. The results are shown in [Table 2]. The significant P value of the interaction effect of cement versus surface modifications indicates the load required to debond the copings that were statistically different by the cement used and by the surface modifications. The significant P value of the cement used infers that the three types of cement were statistically different with respect to their loads required to debond the copings. Scheffe's multiple comparison test [Table 3] has been used to compare the load required to debond the copings when three types of cements were used with two surface modifications. 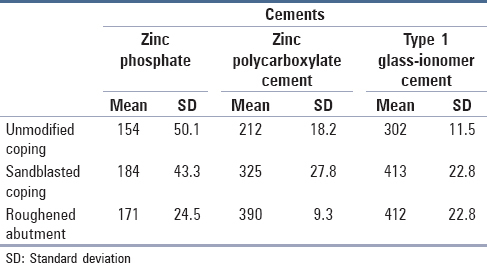 The significant P value of all the three comparison, that is, zinc phosphate versus zinc polycarboxylate, zinc phosphate versus Type 1 glass-ionomer cement, and zinc polycarboxylate versus Type 1 glass-ionomer cement, indicates that all the three types of cements were statistically significant with respect to the load required to debond the copings. There is a clear indication that Type 1 glass-ionomer cement has superior bonding quality than the other two types of cements, and zinc polycarboxylate bonding quality is better than zinc phosphate cement. The bar diagram [Figure 5] depicts that Type 1 glass-ionomer cement has the highest retentive strength to resist the debonding load with respect to sandblasted copings and roughened abutment. Zinc phosphate cement resists the debonding load at its peak when used on sandblasted copings. Zinc polycarboxylate cement shows its best retentive strength when used along with roughened abutment copings. Cement type may be of the deciding factor of retention but prosthodontists who plan for progressive loading desire retrievability of the superstructure. When cements selected with superior retentive properties are used, retrievability of the prostheses may be a problem. Retrievability could damage both fixture and abutment while employing aggressive removal techniques. On the other hand, the selection of cement that is not retentive enough could be a potential source of embarrassment for the patient. Provisional cements such as zinc oxide eugenol cement were developed for short-term use. Definitive cements such as zinc polycarboxylate, Type 1 glass-ionomer cement, and hybrid cements were developed to provide strong and lasting cementation. No single cement will suffice for all clinical situations. Within the limitations of this study, the following conclusions have been made. The retentive properties of the three types of cements tested in this study were statistically significant. Type 1 glass-ionomer cement shows the highest mean retentive strength, followed by zinc polycarboxylate and zinc phosphate cement. There was no statistically significant difference between the sandblasted and roughened abutment copings cemented with Type 1 glass-ionomer cement. 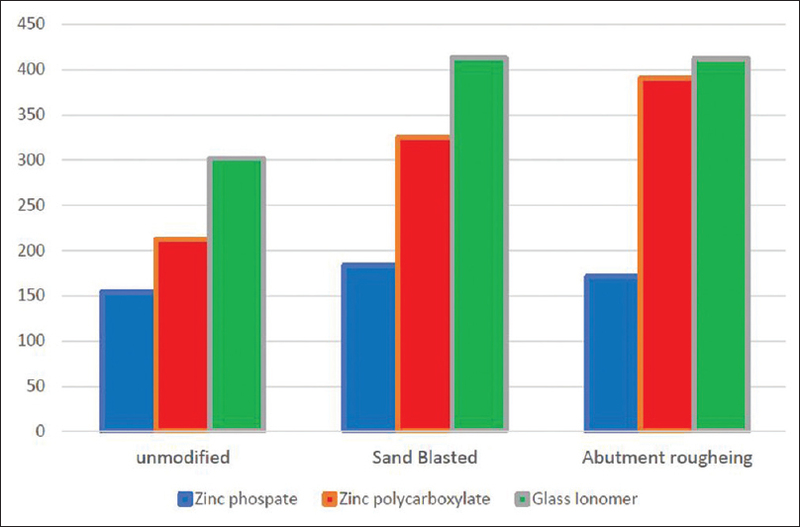 There is a statistically significant difference between the sandblasted and roughened modification of abutments cemented with zinc polycarboxylate cement. Zinc phosphate cement provides better retentive strength when copings were sandblasted. Hence, from the above statistical data, ranking order for retentiveness of the copings is Type 1 glass-ionomer cement provided the maximum retention, zinc polycarboxylate cement provided moderate retention, followed by zinc phosphate cement. Al Hamad KQ, Al Rashdan BA, Abu-Sitta EH. The effects of height and surface roughness of abutments and the type of cement on bond strength of cement-retained implant restorations. Clin Oral Implants Res 2011;22:638-44. Saito C, Sakai Y, Fusayama T. Adhesion of Polycarboxylate cements to dental Casting alloys. J Prosthet Dent 1976;35:543-8. Mehl C, Harder S, Steiner M, Vollrath O, Kern M. Influence of cement film thickness on the retention of implant-retained crowns. J Prosthodont 2013;22:618-25. Mehl C, Harder S, Wolfart M, Kern M, Wolfart S. Retrievability of implant-retained crowns following cementation. Clin Oral Implants Res 2008;19:1304-11. McComb D. Retention of castings with glass ionomer cement. J Prosthet Dent 1982;48:285-8. Lewinstein I, Block L, Lehr Z, Ormianer Z, Matalon S. An in vitro assessment of circumferential grooves on the retention of cement-retained implant-supported crowns. J Prosthet Dent 2011;106:367-72. Wolfart M, Wolfart S, Kern M. Retention forces and seating discrepancies of implant-retained castings after cementation. Int J Oral Maxillofac Implants 2006;21:519-25. Norman RD, Swartz ML, Phillips RW. Studies on the solubility of certain dental materials. J Dent Res 1957;36:977-85. Schneider RL. Evaluation of the retention of castings to endosseous dental implants. J Prosthet Dent 1987;58:73-8.
de Campos TN, Adachi LK, Miashiro K, Yoshida H, Shinkai RS, Neto PT, et al. Effect of surface topography of implant abutments on retention of cemented single-tooth crowns. Int J Periodontics Restorative Dent 2010;30:409-13. Kim Y, Yamashita J, Shotwell JL, Chong KH, Wang HL. The comparison of provisional luting agents and abutment surface roughness on the retention of provisional implant-supported crowns. J Prosthet Dent 2006;95:450-5.